WELCOME. The CLUBSIDE RESERVE residents welcome you to our community web site. Our beautiful and maintainance free lifestyle neighborhood consists of 84 carriage homes, a clubhouse, a pool and spa and two lakes, all conveniently located within the luxury neighborhood of The Vineyards - Naples, Florida's Preeminent Luxury Golf Course Community! Clubside Ladies attending the 2019 Naples Flower Show: Sandy Dall, Gina Beare, Marion Rolandi, Susan Pooley, Charlene Richard, Patty Gibbs (Left to right). 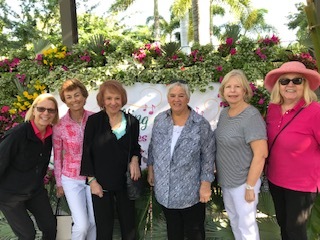 The Annual Clubside Reserve Ladies Luncheon & Flower Show to see the Naples Garden Club flower exhibit and competition at the Naples Botanical Gardens on Friday, March 22nd was a true delight. These ladies attended to show their support to our very talented neighbors, Barbara Sampson and Renee Rosch Lewis who design pieces each year for the flower show competition. This years show set a spectator record of 6,340. The Clubside ladies had lunch afterwards at Celebration Food Truck Park located at 2880 Becca Ave., Naples, FL 34112 just off Bayshore Drive. Please keep an eye out in your email inbox for the next monthly Clubside Ladies Lunch location and fun events. The Social Committee Co-Chairs, Susan Pooley and Charlene Richard organize two lunches per month. Should you have a favorite restaurant that you would like everyone to try, then just send an email to social@clubsidereserve.org with your suggestions. Clubside Reserve Board with PMP Representatives at Annual Meeting at Vineyards Community Center. (2019 Board left to right) Charlie Richard, Don Bucknam, Steve Pooley, Ralph Webster, Graham Beare. (Front) Steve Campbell , (Back) Thomas Large and Dena Waltchack of PMP. We welcome the new 2019 Clubside Reserve Board! 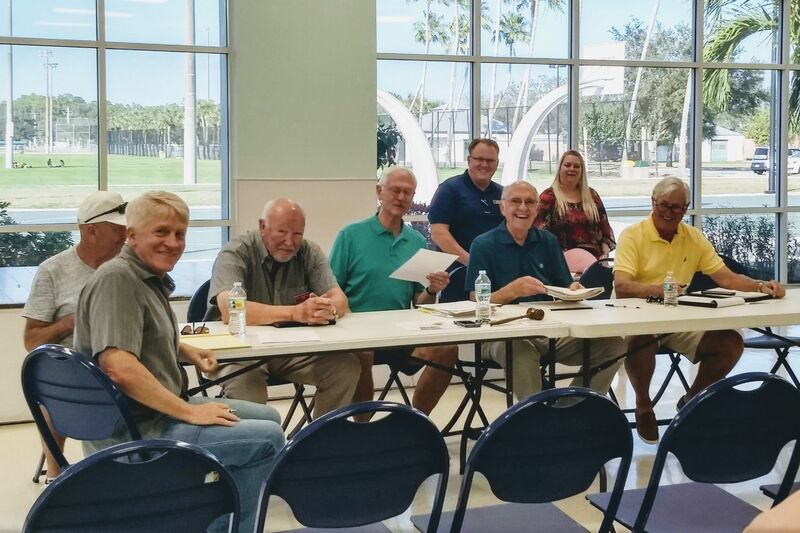 It was on Tuesday, February 5th that the Clubside Reserve Annual Board Meeting and our Annual Organizational Board Meeting took place at the Vineyards Community Center, 6231 Arbor Blvd. Naples, Florida. The following officers were elected for 2019. On February 11 Ralph Webster announced that Stephen Pooley has volunteered to chair our Lakes and Fountains Committee. Ladies Luncheon: Clubside Reserve ladies' meet the 2nd and 4th week at 12:00 each month outside the clubhouse to carpool. Lunch locations to be announced. Email with details are sent prior to each luncheon. Men’s Luncheon: Look for details and sign-up sheet in mailroom. Schedule varies during the season. The HAPPY HOUR schedule is posted in the mailroom. Happy Hour is held at the Clubhouse on the third Thursday of each month at 5:30. Contact Social Directors, Susan Pooley or Charlene Richard at social@clubsidereserve.org about Happy Hour ideas, Grill Nights or hosting an event. If you have a private party or event that you would like to reserve the Clubside Reserve clubhouse for then please contact Property Management Professionals, Inc. (PMP) at 239-353-1992 to see if the date and time you want for your event is available. Reservation forms and a $100.00 refundable deposit must be dropped off or mailed in to PMP to lock in your reservation. Neighbors Renee Rosch Lewis and Barbara Sampson are active members of the Naples Garden Club. Each year they design pieces for the Annual Naples Garden Club Flower Show that is held at the Naples Botanical Gardens. 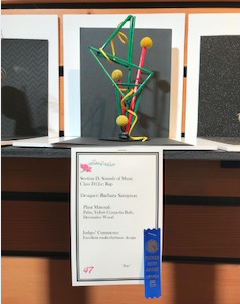 Congratulations to Barbara Sampson for being awarded with a Flower Show Blue Ribbon for her design in Sounds of Music, Class D12-c: Rap. 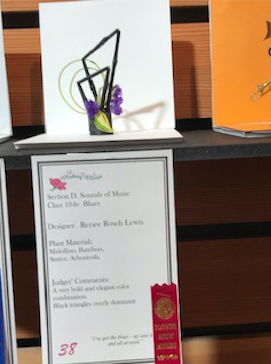 Congratulations to Renee Rosch Lewis for being awarded with a Flower Show Red Ribbon for her design in Sounds of Music, Class 10-b: Blues.